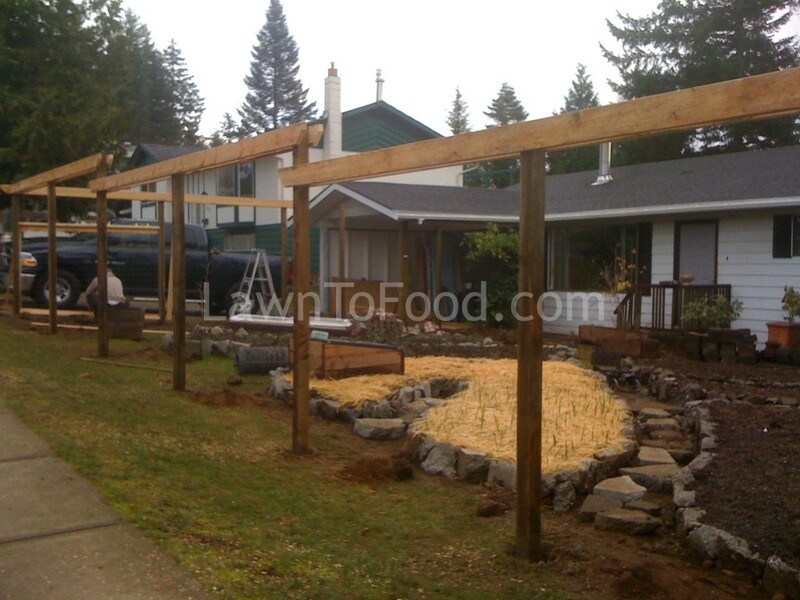 In the spring of 2012, we started expanding our vegetable garden from the back yard to the front. The front yard is sheltered and receives more sun than our back yard, (except for one shadow-casting tree) so it made sense to use the space. 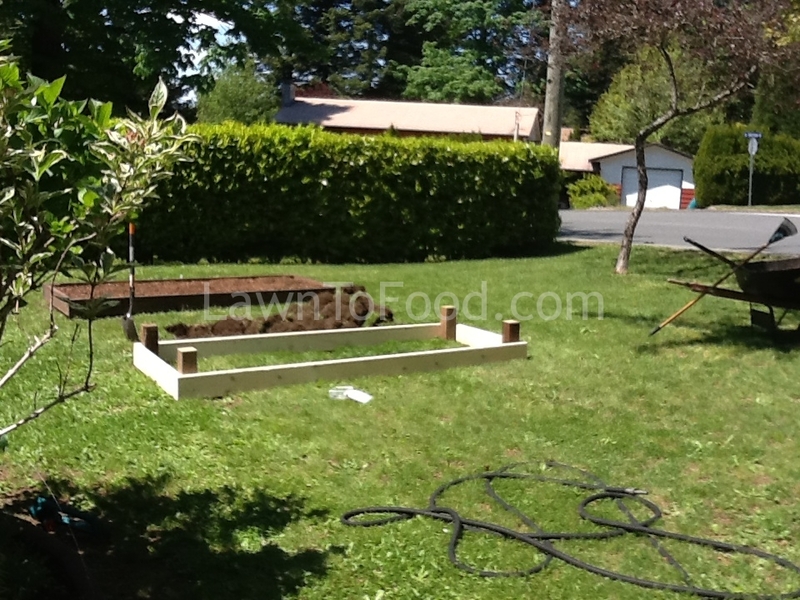 Regardless of the shade, I “double” dug up the lawn and built two 3’x8′ raised beds. 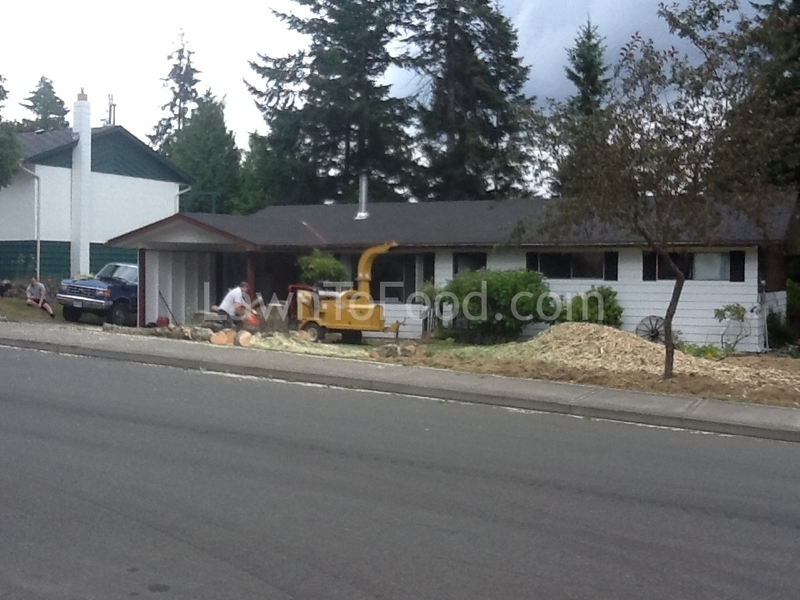 Chunks of 4″x4″ post were used in the corners of the 2’x6′ lumber. I filled the boxes with some composted leaves and soil from a corner in our back yard. 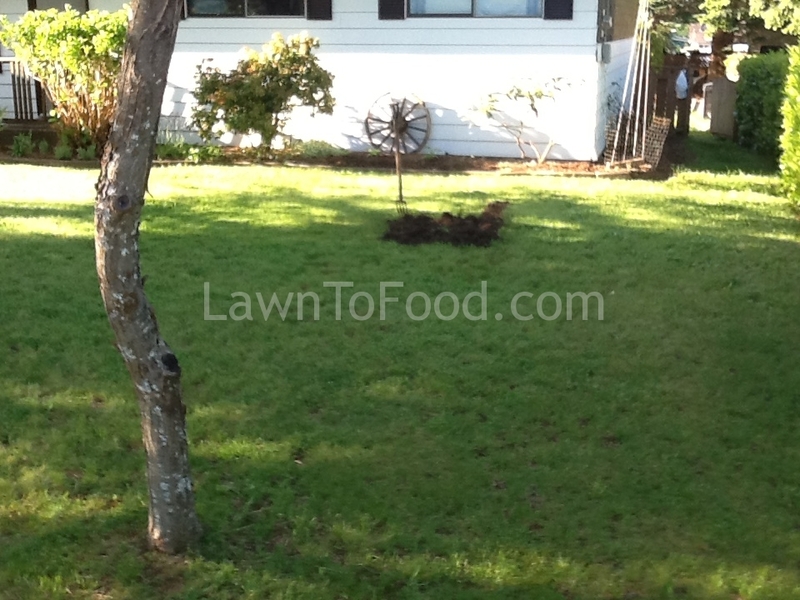 My next concern for these two front yard beds was vandalism from the local deer population. I researched which vegetables they most likely WOULDN’T eat and planted accordingly. The research was fairly correct. I was able to harvest many baby carrots, some garlic and onions. However, the green beans didn’t survive nor did the DELICATA squash, but we managed to salvage one pumpkin. 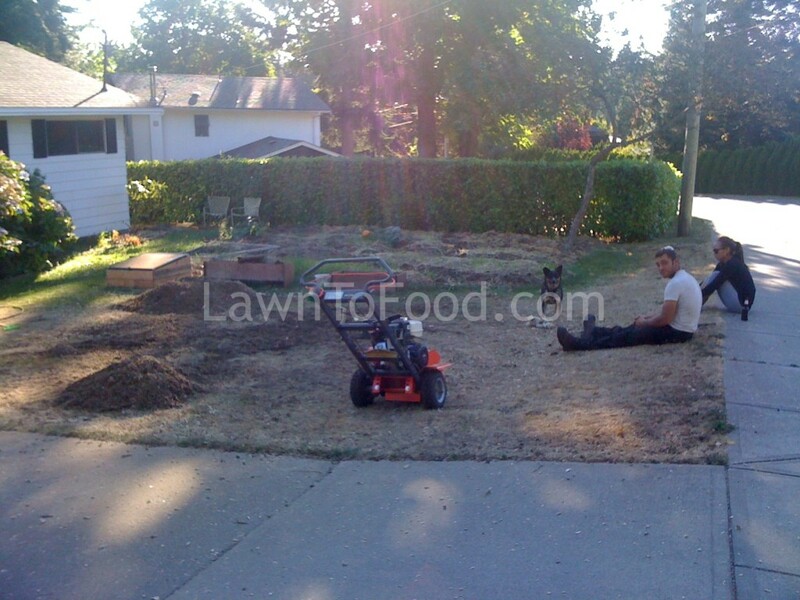 In about August, my husband and I decided that it was time to get serious about growing more of our own food. It was becoming more important to us as a couple, to eat fresh, organic fruits and vegetables daily. Another plus to expanding our own food production is self-sufficiency, after all, we do live on an island in an earthquake zone. In addition, our son, daughter-in-law and grandson had just relocated to the Comox Valley so the family was “growing” and there would be more mouths to feed. 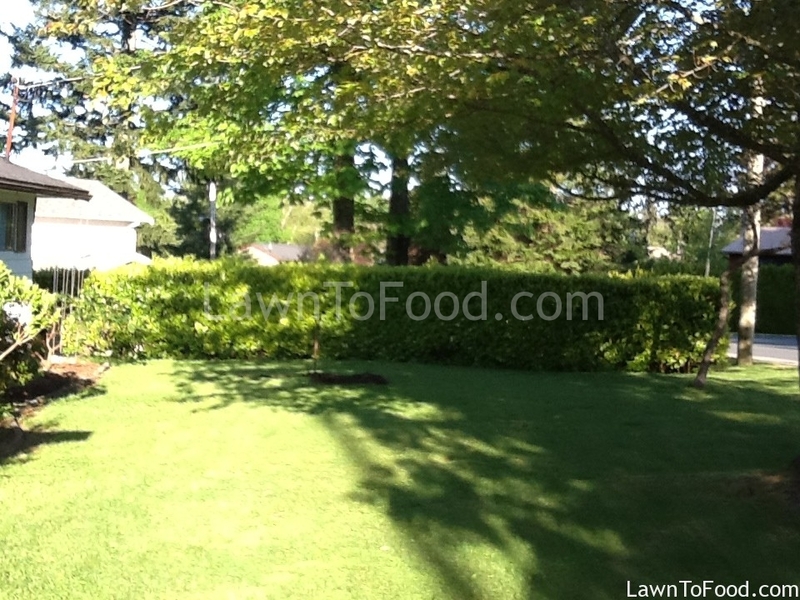 Hence, we decided that almost all of our lawn would be transformed into food-producing plants. We did a lot of reading on the subject of Permaculture, involving food forests, water conservation, and working with natural elements rather than against them. Our goal in designing the new garden would be to incorporate as many Permaculture principles as possible into our small urban setting. 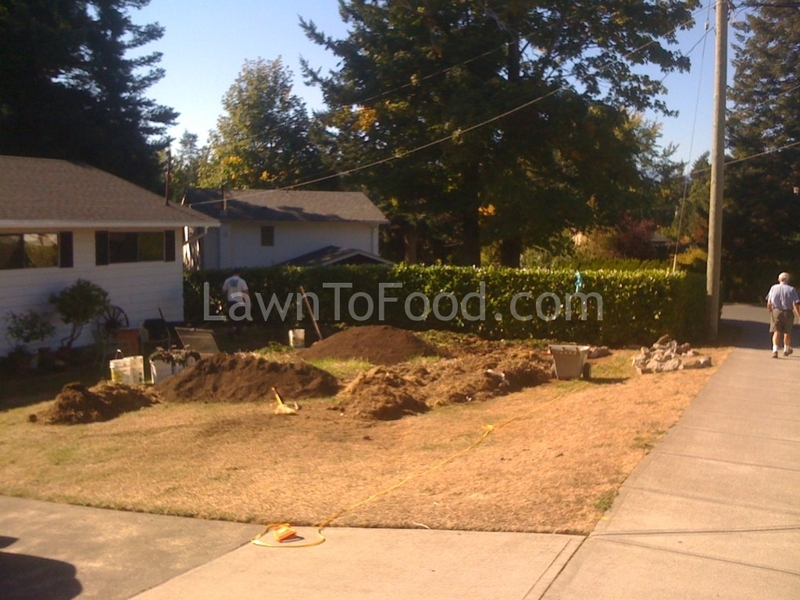 The first step, was to NOT dig up the lawn, which would disturb the life below. 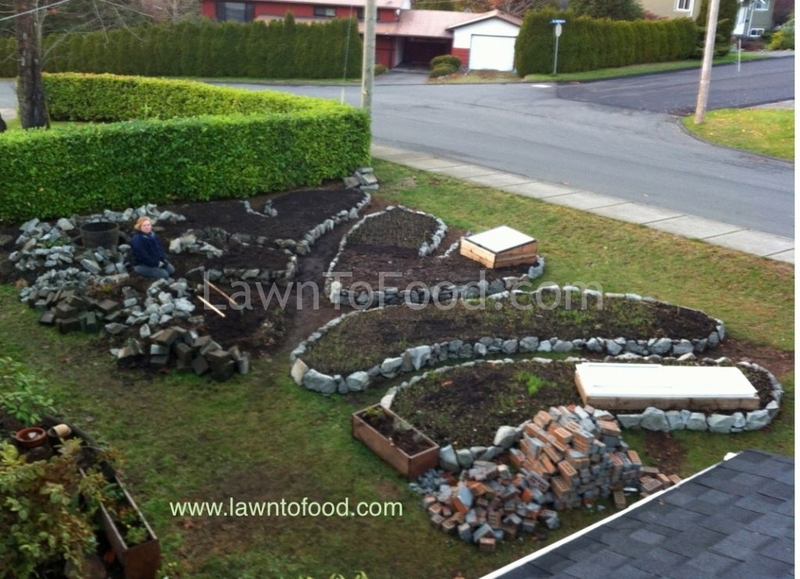 Instead, we decided to layer up the new raised beds with organic materials. Newsprint from our recent move to the Comox Valley would be the first layer. This would smother light from the grass but allow water to permiate. 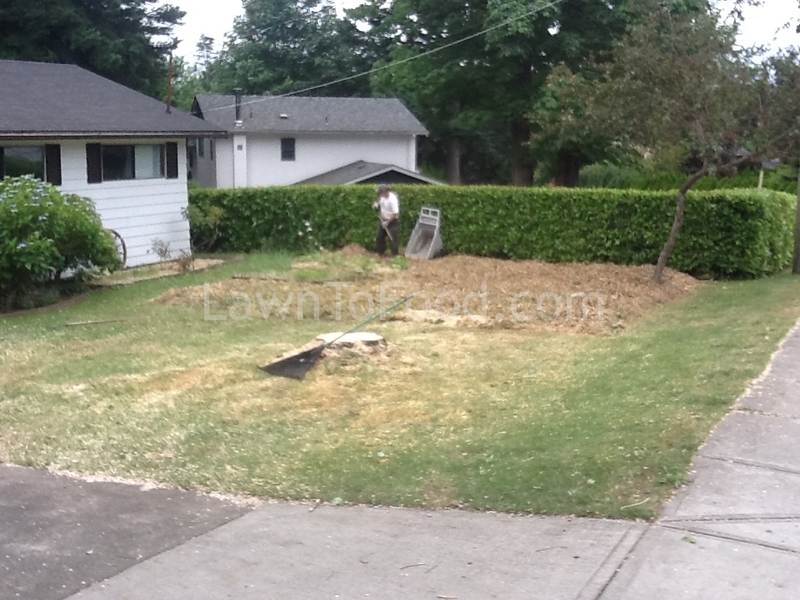 Our second layer was pickup truck loads of grass clippings from a local school ground. This particular school is closed down, and it is obvious by the variety of vegetation, that chemical fertilizers and weed killers were not used on the property. Brusselsprout was having a “hay day” in the pile of clippings. 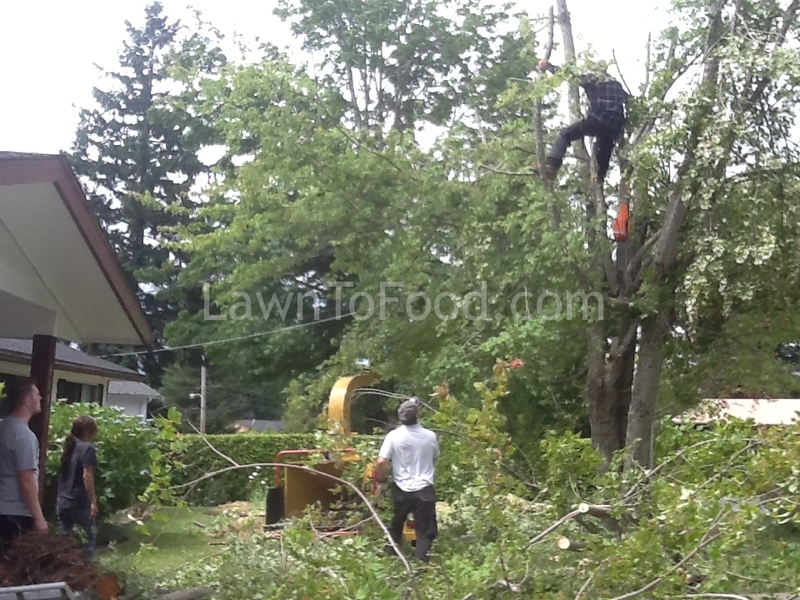 Next on the list, was to remove a large tree from the front yard. 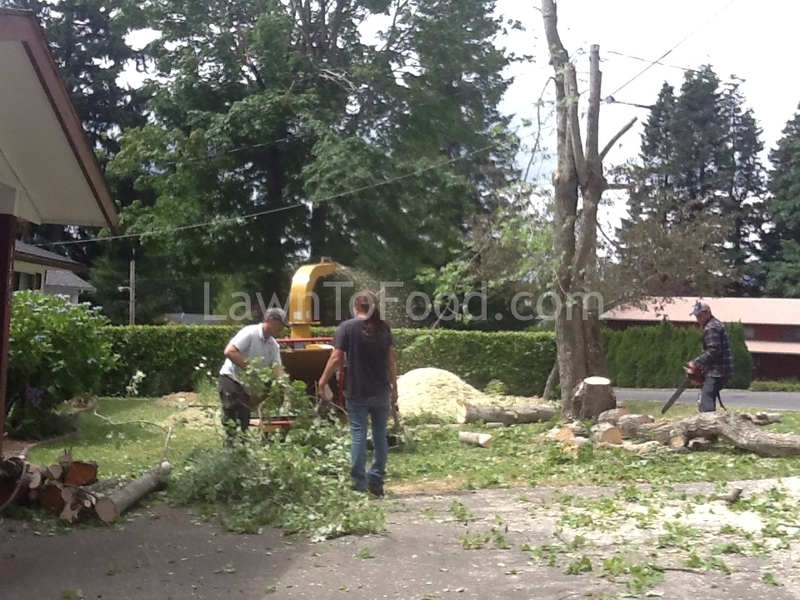 Not only was this tree causing too much shade, it was a hazard to the house as it had not been pruned or cared for by the previous owners. We tried to save a second, smaller tree in the front yard, but it was also weak and diseased. 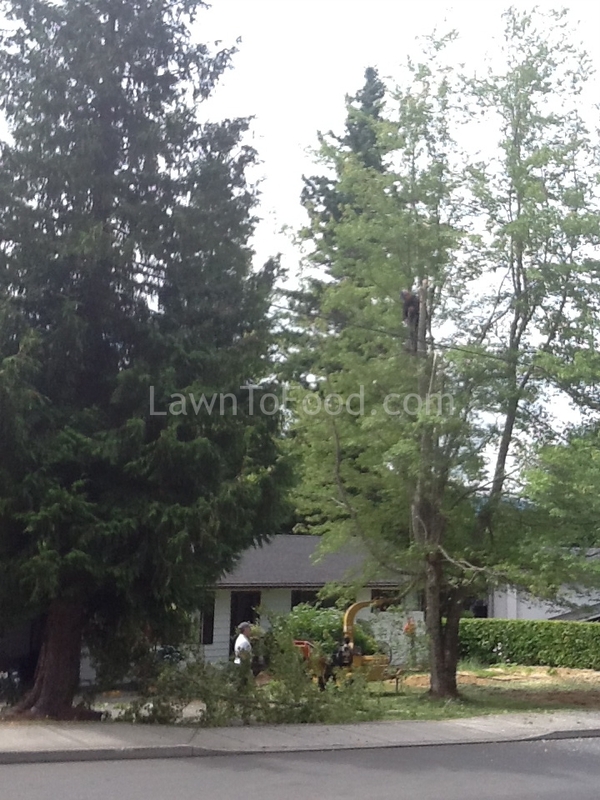 That is our son, (a proffessional tree guy) high in the tree top, bring down the branches one by one. 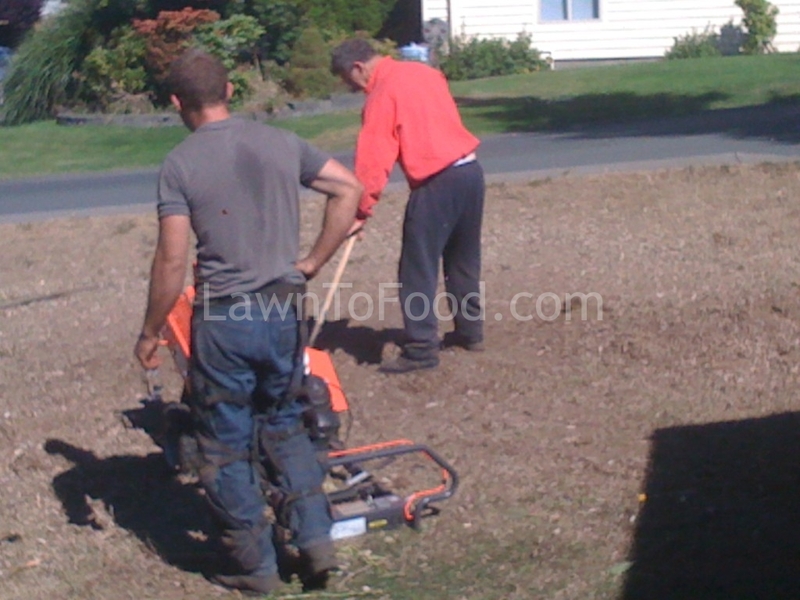 We rented a wood chipper for the day and the ground crew fed it branch after branch. The tree also yielded us a big pile of firewood. All of the wood chips from the maple-type tree, stayed on the property and were used as mulch for pathways and around the base if shrubs. Some of the wood chips got mixed into the garden layers and that was a mistake. 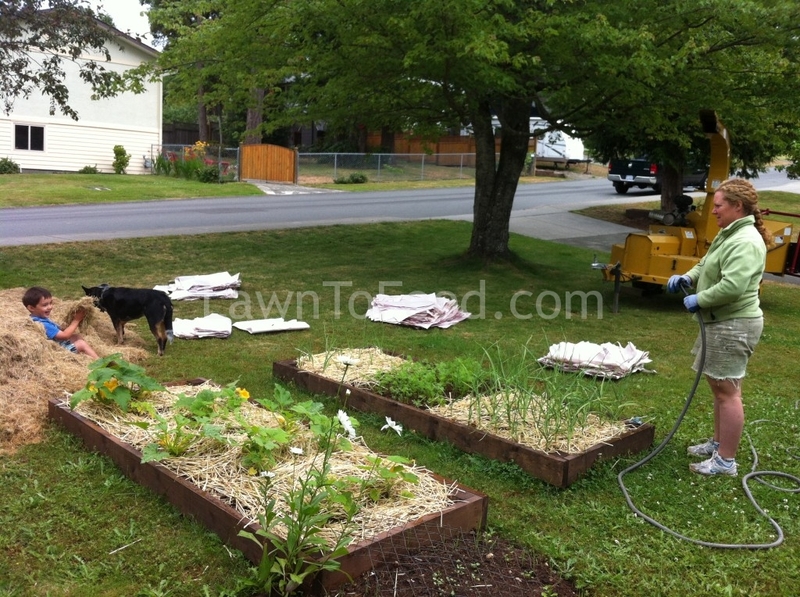 When new wood chips decompose they take large of amounts of nitrogen from the surrounding soil, making adequate amounts unavailable for growing vegetables. In my opinion, fresh wood chips are great for pathways and as mulch around shrubs and trees, but not in the vegetable garden. 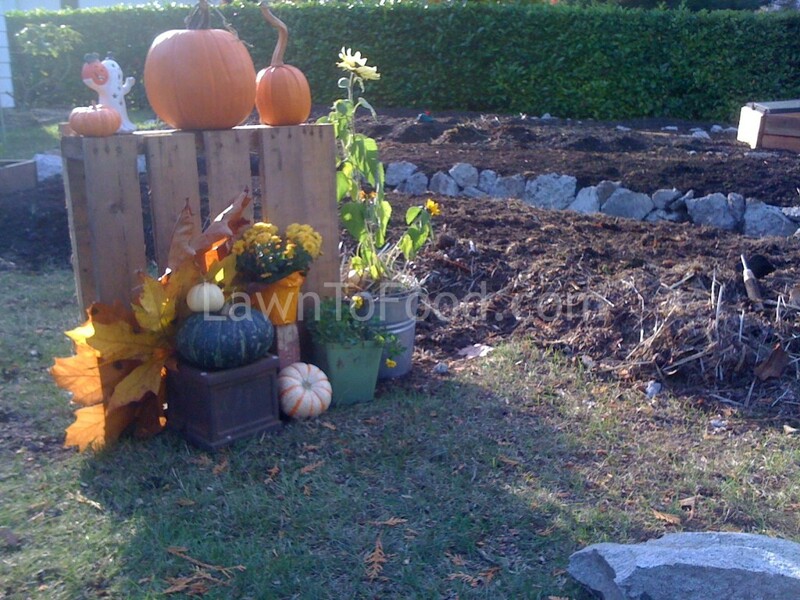 In the middle of the picture above, you can see an orange dot, which is our one pumpkin that survived the garden transformation. It’s coming into September now, and I really want to get the beds set up, so they can settle over the winter. We had 4 yards of organic soil delivered. 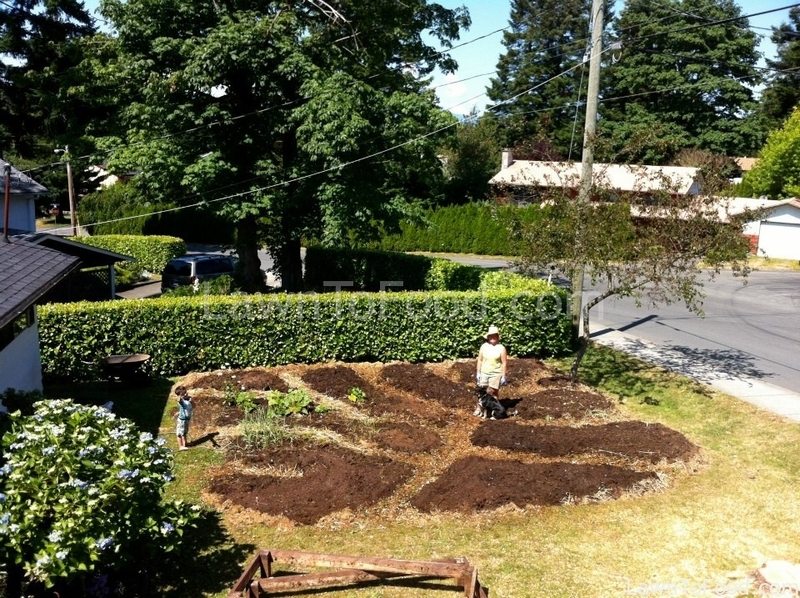 I started forming the vegetable beds roughly into the shape of an Oak leaf. I really like the natural flow feeling of the pathways through the leaf shape. The beds aren’t more than 4 feet wide, for easy reaching. 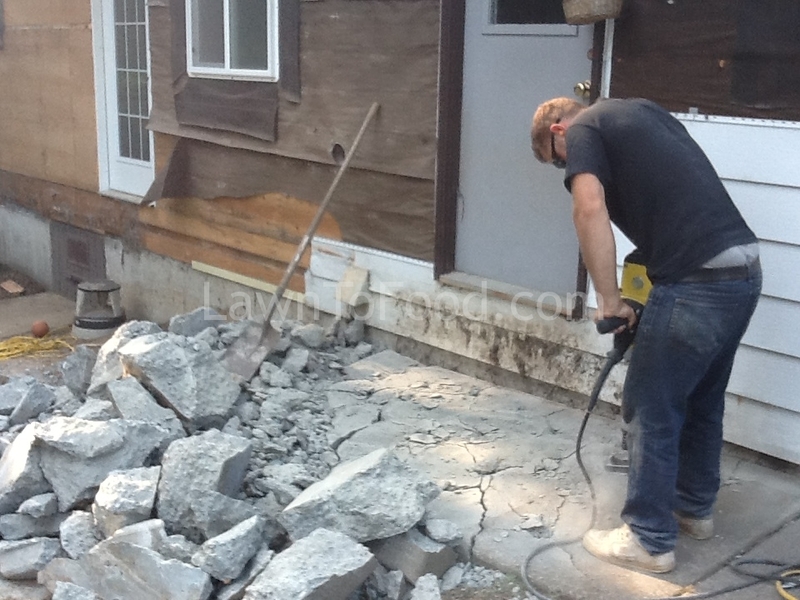 As other renovations were progressing at our house, a large amount of concrete was starting to pile up in the back yard. 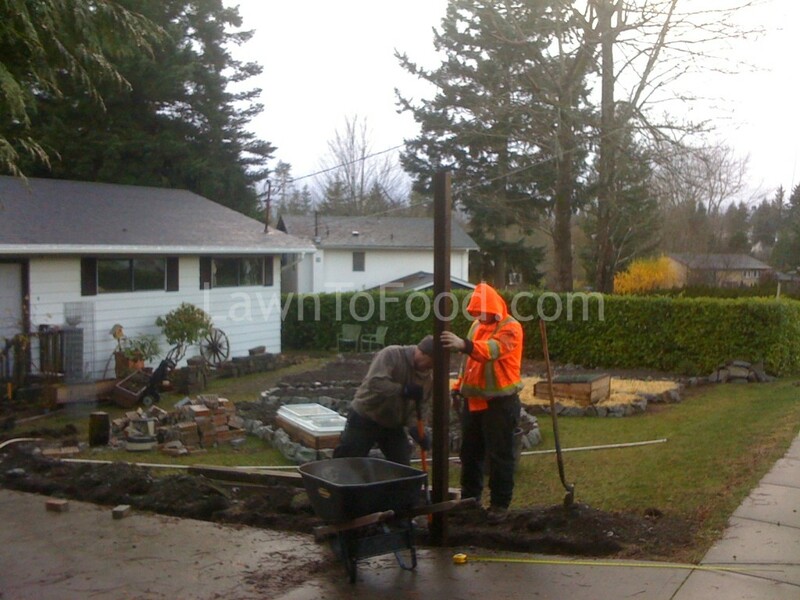 We decided to re-purpose the concrete chunks by using them to retain the new vegetable beds. The material was free and easy to work with. In Permaculture lingo, up-cycled concrete is called Urbanite. By the time October rolled around, the garden was really taking on a great shape. The garlic started to poke through the ground in December that year. In January, my husband & son, built the front fence to protect the garden from deer. In addition to keeping the deer out, the fence was designed to allow passersby to see the lawn to food progress, provide trellises for grapes plus mesh for climbing vegetables. 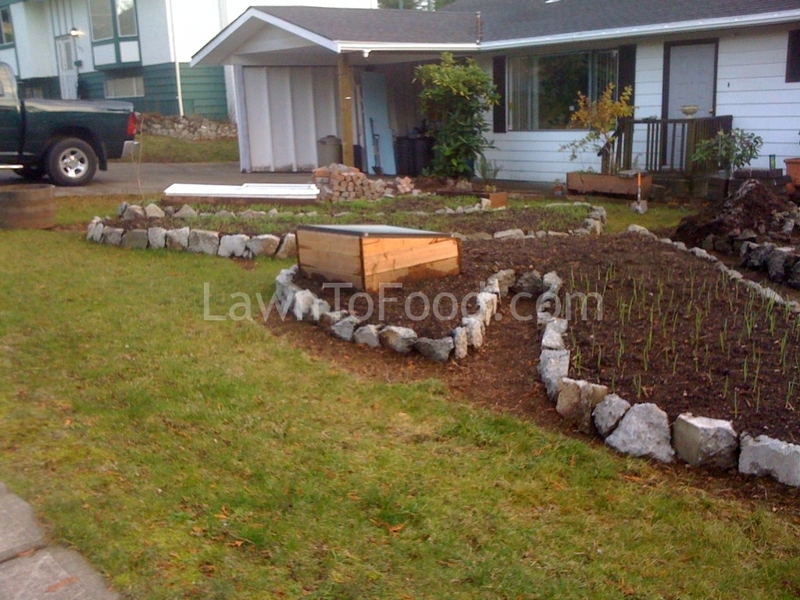 Now it is February 2013, the garlic is growing and lettuce is planted in a small cold frame. The “lasagna” layering of the garden is continuing. 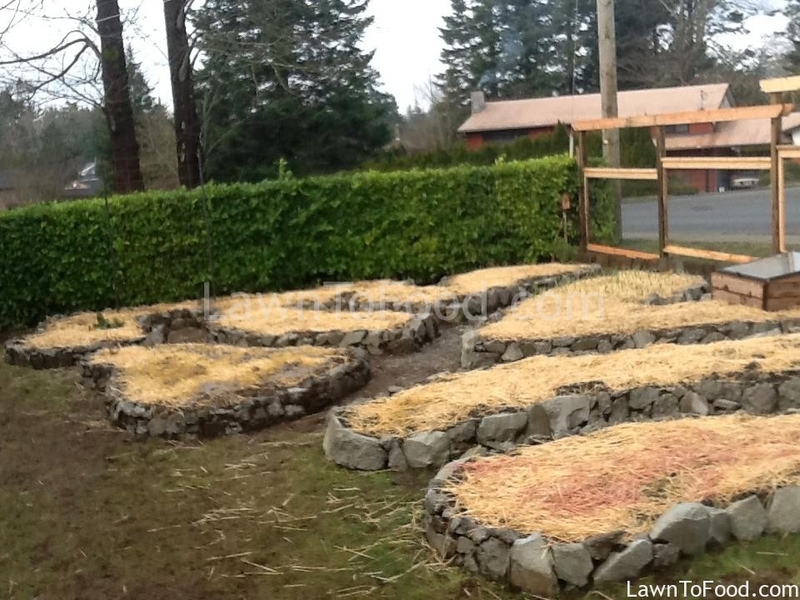 Straw has been added as a top layer, over top of the organic soil, as well as leaf mulch and buckets of seaweed that we collected from the local beaches. The recycled concrete (urbanite) retaining walls are complete. Our new garden is all tucked in for winter. 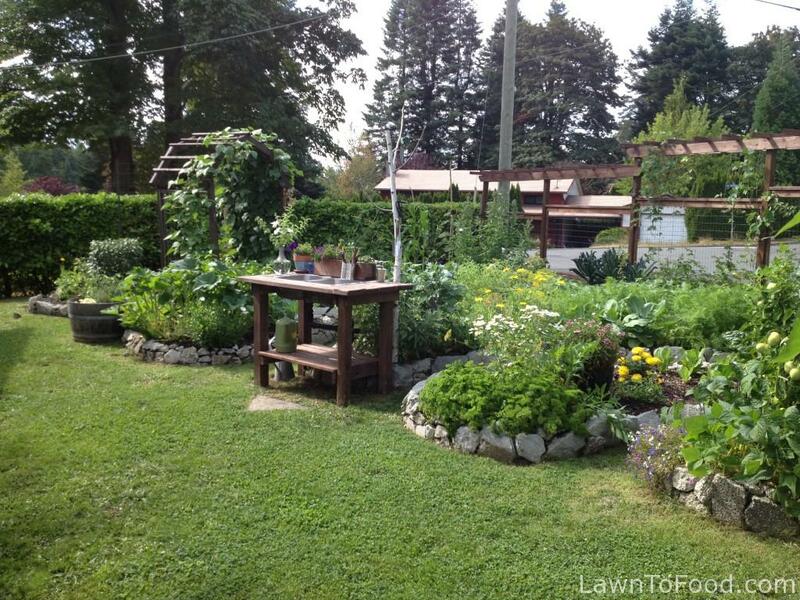 This entry was posted in Comox - Hillside Ave, Yard Transformations and tagged building, frontyard, lawn to food, new garden, raised beds, transform, tree removal, vegetable plot by Lynda. Bookmark the permalink.